Part performance lecture, part poetry, part love-song – Still or Sparkling? is funny one moment and moving the next. It’s global and it’s personal and it’s all about water. Water is everything and so we are getting deep – way out of our depth – and we are messing about in the shallows as well. Unexpected, fun and intriguing. If you have water in your body you’ll love Still or Sparkling? If you’re an electrical appliance you probably won’t. 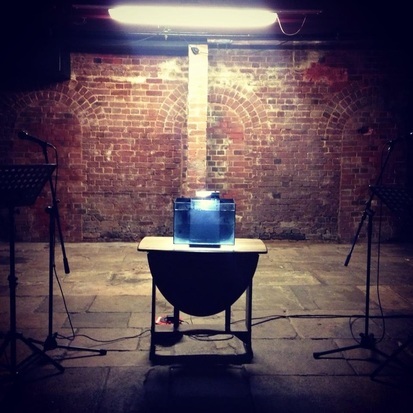 PIDGE Theatre is a collaboration between Jess Burford-Redgrove and Sapphire Urwick. They started making work together in 2011, performing their first piece This Way Up at the North Devon Fringe Theatrefest, since then they have made three more shows as a pair, toured and collaborated with others to make work. PIDGE is a conversation between Jess and Saf about life, the universe and everything, which they extend to their audience. They make work that is funny, tender, friendly and secretly clever.